The historic origins of Conil are unclear, although this is due to varying expert opinions on its history. It seems to have first been a series of scattered prehistoric settlements, an argument supported by prehistoric artefacts found in the region.Notwithstanding this ancient evidence of settlement, its habitation was confirmed around 1500BC, with the arrival of the first Phoenician settlers. These settlers identified the abundant fishing grounds off the coast, and in particular established almadrabas (in fact, a later, Arabic, word), a system of setting nets to catch migrating tuna when they are running. When the Romans and Visigoths took over the area, the port of Conil was one of the most important in the region. Much later, with the arrival of Muslim settlers, Conil passed into the dependency of the nearby fortified hilltop town of Vejer de la Frontera. Alfonso X, the Wise, who reconquered the area, ruled over an area where, briefly, Muslims and Christians lived side by side. It was king Sancho IV who passed on all the tuna fisheries to local legend Alonso Pérez de Guzmán, in recognition of his bravery in defending Tarifa against a Muslim attack in 1296 (his bravery also won him the honorific Guzmán el Bueno, ‘Guzmán the Good’, as any local school child will explain). The king also made Guzmán Duque (Duke) de Medina Sidonia, after the nearby town and regional capital, with all the land that came with it. 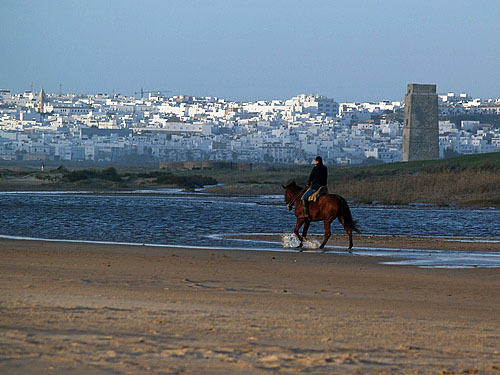 From then on Conil came under the rule of the Duques de Medina Sidonia, a system run on feudal lines until the establishment of the Cortes (parliament) de Cádiz in 1812, and from 1814 the election of its Cabildo, council, was made by an appointed regent, nominating a single mayor under the new constitution.